Rotate the saw head on these horizontal mitering band saws to make angled cuts without having to rotate the stock. With horizontal band saws, the workpiece is clamped to the table and the blade is lowered and moved through the workpiece to make the cut. Clamping the workpiece improves the finish and accuracy of the cut. 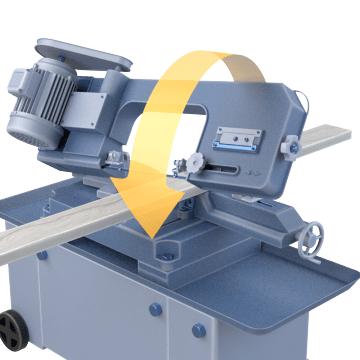 Band saws have a belt-like blade with sharp cutting teeth that is continuously fed through the tool as it operates, typically producing cleaner cuts than reciprocating saws.